The Zothren Have Invaded Earth! 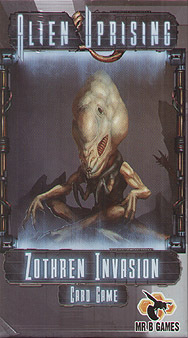 Zothren Invasion is a stand-alone card game set in the Alien Uprising universe. This time it is every crewman for themselves in this fast, action packed dice chucking sequel. Crewmen take turns drafting parts for their giant mech - a robot-like suit of armour they will pilot to defeat the hordes of invading Zothren 'bugs'. Each player will have access to a small had of items that can help them (or hurt others) in their quest for the most fame. The holocrons are rolling. The Zothren invasion will be televised. Does your hero have what it takes to be the true defender of Earth?